Art of the strange and grotesque was his forte. Alien would not be what it is today without the art from H.R. Giger. Just take a cursory image search on Google for ‘Alien’ and the first thing that will come up is the design for the terrifying creatures from Giger’s pages. The aliens of H.R. Giger have tied everything together throughout the Alien series, even as the actors and actresses portraying the prey frequently change. While those designs might be his most memorable achievement, Giger created countless art pieces conjuring up nightmare fuel. By 1967, at the age of 27, Giger was fully immersed in his art. Even though he had a 9-to-5 job, he would spend his evenings creating larger ink drawings. According to the HR Giger Museum, he created some of his early celebrated pieces during that time such as The Astro-Eunuchs seen below. You can see where many of his future concepts came from with this early drawing. His style that would be come to be known as “biomechanical”, mixing lifeforms with technology. Apparently it was his own source of nightmares, as it was born out of art therapy for his night tremors. In the mid 70’s, Alejandro Jodorowsky was trying to bring Frank Herbert’s Dune to the big screen. 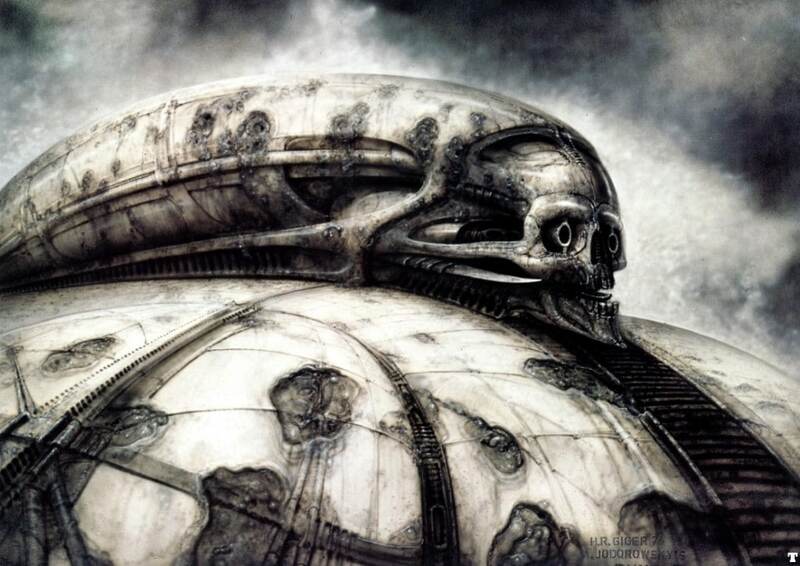 Giger was part of the early concept art for the film showcasing some designs that never really put to fruition. It’s easy to imagine that Giger might’ve gotten the same amount of attention he ended up receiving for Alien had this come out, but it just wasn’t meant to be. There’s no question that Giger’s designs give people very divisive reactions – either you are absolutely floored by their concepts and design, or you are terrified beyond your wildest dreams. They can also be interpreted as extremely sexual. According to Bloody Disgusting, “His unnervingly stunning work within the pages predominantly features illustrations of the human form coalescing with meticulously envisioned machinery, in a multitude of different, and often times, sexually explicit ways. Torment, pain, and sexual ecstasy seem to be a common theme.” Take a look at one what many would call the signature image for the Alien franchise. From this image you can see the inspiration for what would become the ‘Xenomorph’, the signature antagonist of the Alien franchise. It’s hard to imagine any other design for the creatures that would come to terrorize the crew of the Nostromo. Thankfully, Ripley gets to kick it out into space. Working on Dune did eventually get Giger the work on Alien though. During the production, he got friendly with Dan O’Bannon who was the script writer for Alien. O’Bannon introduced Ridley Scott to Giger’s designs, in particular the Necronomicon IV. Giger was originally brought onto Alien only to be a creature designer, but Ridley Scott saw a lot more in Giger’s designs. Not only did Giger give his designs for the Xenomorph, but also for Alien eggs, the Pilot, and ship designs. These incredible sketches and ideas elevated Scott’s story of a crew being attacked on a undiscovered planet from B-movie status to something really special. There are few images in science-fiction that are as memorable as the Xenomorph. It has stood the test of time for a good reason – it is terrifying. Although it made its home on LV-426, it has also made its home in our subconscious, always lurking in the shadows. H.R. Giger might not be with us anymore, but his widely inventive designs will always be.